The NEEM camp is located some 1200 km North of Kangerlussuaq and 500 km East of Thule. "In the NEEM ice core we have achieved the most comprehensive survey of ice for the current climate period. This will allow for a detailed description of climate evolution throughout the history of civilisation and will certainly lead to an improvement in the dating of past climate events", explains Jørgen Peder Steffensen, an ice core researcher at the Center for Ice and Climate at the Niels Bohr Institute, which is leading the international project. He explains that researchers have also attained the most comprehensive measurement of ice from the last ice age in the NEEM ice core. These measurements, combined with data from previous ice cores: NGRIP, GRIP, GISP2 and Dye-3, will improve the picture of the dynamics and magnitude of the more than 20 abrupt climate changes during the last ice age. 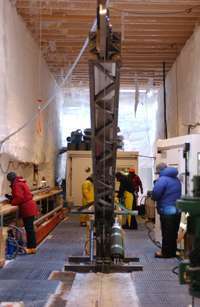 The researchers have drilled ice cores all the way through the 2.5 km thick ice sheet. The NEEM ice core contains more that 150 m of ice from the Eemian period and more than 100 m of ice from the previous ice age below the Eemian layer. However, the measurements show that the layer sequence above and below the Eemian ice is broken. This means that they are now carrying out measurements on the ice so that the layer sequence can be reconstructed. Once this reconstruction is completed, you will get very detailed information about the conditions during the Eemian period. The NEEM ice core, along with the other ice cores, will be an anchor point for the interpretation of airborne radar measurements of the ice sheet, as many of the layers in the ice can be read by the latest radar systems. This makes it possible to measure the extent and thickness of the ice from the Eemian and older ice in Greenland and thereby improving the knowledge about the dynamics and size of the ice sheet in two ice ages and interglacial periods. It is of particular importance to determine the size of the ice sheet during the Eemian, which was 5 degrees warmer than today, in order to determine to what extent the Greenland ice sheet will contribute to the rise in sea levels in the next 100 years due to global warming. The NEEM ice core contains more than 150 m from the Eemian period and more than 100 m ice from the previous ice age. However, measurements indicate that the sequence of layers above and below the Eemian ice has been broken. Presently, new measurements on the ice core are made to reconstruct the original layer sequence. Once this reconstruction has been completed, new and detailed information on Eemian climate will emerge. They also managed to drill through layers of stone and gravel near the bottom and traces of DNA in these layers along with the dating will provide valuable information about the age of the ice sheet in Northern Greenland and life in Greenland before the ice formed. "To summarize, we can say that the NEEM project has accomplished all of its scientific goals. The hope of finding undisturbed layer sequence of Eemian ice was not fulfilled; but it is a basic scientific condition when you are exploring the unknown: that nature always surprises you. On the other hand, we have learned a great deal about how the old and deep ice flows - something that is important for predicting the development of the ice sheet in a warmer period. An unbroken Eemian sequence must wait for another time. In the meantime, we are writing a series of scientific articles about the results from NEEM, which will make us wiser about the climate of the past and will improve the guesses about future climate developments and the fate of the ice sheet", says Dorthe Dahl-Jensen, Professor and head of the Centre for Ice and Climate at the Niels Bohr Institute. You aren't going to find an un-broken ice sheet from before ANY interglacial. That should be fricken obvious to a 5th grader, nevermind anyone that gets payed to be an "expert" in this field.